When you pray you are talking to God but when you read your bible, God talks back to you. As I was studying my bible yesterday, the Holy Spirit directed me to the story of Obed Edom. Obed Edom' s house was the place the Ark of the Covenant was carried to after God killed Uzzah for touching the Ark. The Ark had a fearful reputation; when the Ark was captured by the philistines, God destroyed their gods and killed many philistines. As the Ark made it's way back to Israel, some people looked inside the Ark and God killed 70 of them and after that, the Ark remained in the house of a man called Abinadab for 20 years. David decided to move the Ark to Jerusalem and they got to a rocky place, Uzzah touched the Ark to support the Ark from falling and God struck him dead! Imagine they were now bringing that same Ark to your house! However something strange happened; in just 3 months, God had immensely blessed Obed Edom so much that his neighbours reported to the king! They must have noticed that he renovated his house, money was coming in, he bought new horses (new cars) may be he even tarred his street! Whatever it was everyone knew that Obed Edom's story changed from just one of the guys on that street to the main guy! 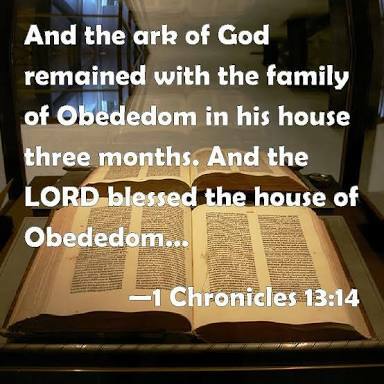 Notice that for 20 years, the Ark was in the house of Abinadab but the bible didn't tell us that God blessed him yet in 3 months Obed Edom exploded! What was the difference between the 2 men and all others? Why did others attract death while Obed Edom attracted blessings? It was the HONOR factor! God is unwilling to stay where He is not honoured! The bible later tells us that Obed Edom and his 62 children and grandchildren became worshippers and gatekeepers who worshipped before the Lord. I believe that Obed Edom and his family worshipped God before the Ark of the Covenant constantly and God saw his heart and blessed him beyond measure. Your body is now the temple of God, your body is now the Ark of the Covenant, God now lives in you! Are you honouring God with your body and in every area of your life? Be conscious that you carry God at all times, it will caution you to watch what you say, sing, watch and the places you go. That could be the single determining factor between success and failure. You too can be a social media evangelist. Please share so that others can be blessed as you have been blessed.